The Summer Reading Challenge is an annual event run by the Reading Agency to encourage children to read in the summer months. “Children's reading can 'dip' during the long summer holidays. The annual Summer Reading Challenge helps get three quarters of a million children into libraries each year to keep up their reading skills and confidence. Because everything changes when we read.”. 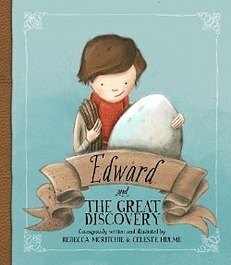 This year, Edward and The Great Discovery written by Rebecca McRitchie and illustrated by Celeste Hulme has been selected for the 2018 Summer Reading Challenge. Edward and The Great Discovery is aimed at children aged 3-6 years. The key theme in this book is exploring and observing English, Science and History. Although he comes from a long line of archaeologists, Edward has never discovered anything. Then one rainy night, he stumbles upon what could be his first great discovery – an egg! But what could be inside the egg? A dinosaur? A dragon? Edward cannot wait to find out. He keeps the egg warm, reads to it and loves it until it finally hatches. It isn’t a dinosaur or a dragon. In fact, it isn’t what Edward expected at all!